Location is in an area where the Troubles were most prevalent. In an effort to restore peace to this area, a twenty foot high barrier was erected along Cupar Way between the Falls Road Nationalist / Republican (Catholic) area south of the barrier and the Shankill Road Unionist / Loyalist (Protestant) area north of the barrier. 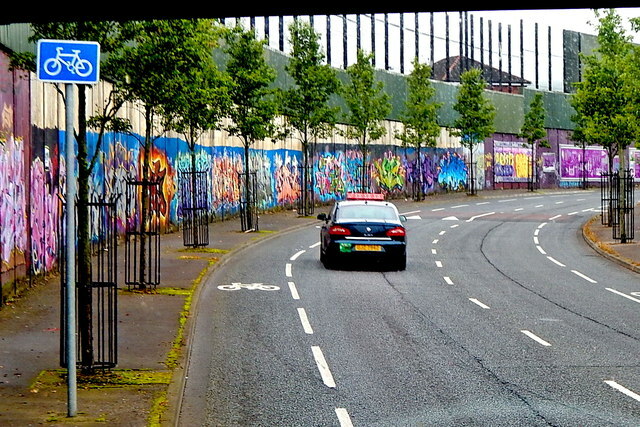 Cupar Way is located along, and north of, the barrier within the Shankill Area. © Copyright Suzanne Mischyshyn and licensed for reuse under this Creative Commons Licence. This page has been viewed about 467 times. Have you seen how many Buses there are in The 'Bus Lane' ?